Honestly, this recipe came about because I had some beautiful Coppa in my fridge but I couldn’t decide between having it on a salad or in a sandwich for dinner. I wanted both. Then I remembered a dish I had several years ago at Cafe Reverie in Cole Valley: it was basically a very thin pizza crust topped with a pile of perfectly-dressed greens and a light sprinkle of salty cheese—both a sandwich and salad. A compromise in the most delicious sense. 1/8 cup Parmesan, shaved $3 for 6 oz. Preheat oven to 475 degrees F. Lightly flour 2 baking sheets or pizza pans. Divide dough into 2 equal balls. Roll out each ball into an 8" circle. Transfer circles to prepared pans. Brush lightly with olive oil and sprinkle with salt. Bake for 8-10 minutes, or until dough looks like a pizza crust, with light brown spots. Toss the spinach with 1 tbsp olive oil and the balsamic vinegar. 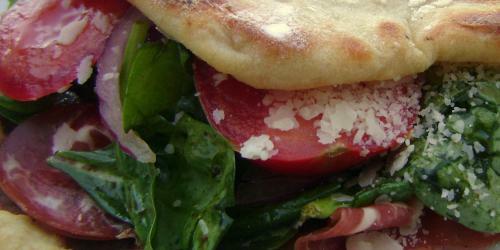 To assemble the piadinas, arrange half of a cooked dough round with layers of meat, tomato and onion. Top with half of the dressed spinach and half of the Parmesan. Gently fold over as pictured. Repeat with remaining ingredients. Slice in half to serve. Such a nice recipe with a unique combination with spinach. I love Popeye shows in my childhood that is why I love eating things make with Spinach. I always searching great recipes on internet having spinach touch. Thanks for this! !